It is seven years since Shelayna Oskan-Clarke had her first taste of international championship competition. In 2008, in her final year as a pupil at Bayliss Court School in Slough, she travelled to India as a member of the England team competing at the Commonwealth Youth Games in Pune. Within a year Semenya was the senior 800m world champion and a global cause celebre. Within three years Sharp was the European 800m champion. Oskan-Clarke finished fifth in the 400m final in Pune, where Semenya won the 800m ahead of Stringer and Sharp. It took her much longer to get on to the major championship stage as a senior athlete. Her baptism did not come until March this year. And, even then, the Berkshire woman with the double barrelled surname shot under the radar as she bowed out in the 800m heats at the European Indoor Championships in Prague. That was before she hit the bullseye of a major breakthrough in the outdoor season, when she reached the two-lap final at the IAAF World Championships in Beijing in August, finishing tantalisingly close to a medal in fifth place. While Semenya and Sharp both exited at the penultimate stage in the Bird’s Nest Stadium, Oskan-Clarke flew to a stunning semi-final victory in 1:58.86. In doing so, in supremely assured fashion, the 25-year-old broke through the two-minute barrier for the first time and climbed from 34th to 9th on the UK all-time list. on her return from Beijing and her season tailed off with 2:05 performances in both Zurich and Rieti. Still, as she disappeared back under the radar, Oskan-Clarke could be satisfied with a breakthrough season in which her promise as a 400m turned 800m runner finally came to fruition. “It has taken me a long time,” she reflects. “After going to Pune, I just didn’t develop along with everyone else. It took me a long time to progress. It certainly helped Oskan-Clarke finally push through to world-class level that she had the guiding hand of Ayo Falola behind her. She had already started dabbling in the 800m before Falola took over from Rodger Hughes as her coach in 2010. The former sprinter has a track record of transforming female athletes with shorter-distance backgrounds into sub two-minute 800m performers – Jo Fenn (1:59.50) was an English Schools silver medallist as a 300m hurdler; Marilyn Okoro (1:58.45) was an English under-20 champion at 400m – and he spent two years on improving her one-lap speed before concentrating on the 800m. Even then, it took patience on the part of both athlete and coach. 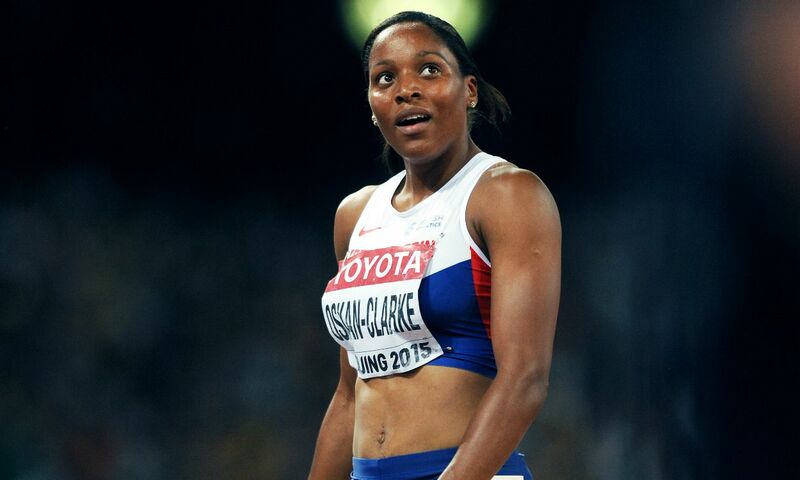 Oskan-Clarke’s PB improved from 2:07.7 in 2012 to 2:03.52 in 2013. In May last year came the first hint of a breakthrough: a 2:01.94 clocking for ninth place in the early-season Diamond League meeting in Doha, followed by 2:01.95 for sixth at the FBK Games in Hengelo. in February. Then after gaining a taste of the big time at the European Indoor Championships, she made steady progress through the outdoor season, all the way to her quantum leap in the semi-final in Beijing – clocking 2:01.27 at Oordgem in Belgium in May, 2:00.90 in Lucerne in July and 2:00.60 at the Anniversary Games, while booking her place on the team for the World Championships as runner-up to Sharp at the British Championships in Birmingham. All of this has been another feather in the cap of Falola, who has been continuing to coach at the highest level while battling against what has now been diagnosed as terminal cancer. “Ayo is full of positivity,” Oskan Clarke says of the man who guided Donna Fraser to fourth place in the 400m final at the Sydney Olympics in 2000. “He just looks forward, thinks of things to improve on. He’s quite a patient person and he doesn’t really give praise unless praise is due. “After my semi in Beijing, and even the final, he said my race was superb. He was really happy. “We get on really, really well. I started working with him in 2010 and it’s taken me a long time to come through. He’s been patient with me but he’s always believed in me. He kept on saying to me I could run faster. “I suppose when you get good conditions and the right race, against the right competition, it all flows together. When I was putting the base training back in after running two sub-2:01s, Ayo kept on saying,’Your body’s now preparing itself to make a big jump.’ Which is just what happened. “I was so focused on not making any mistakes on the back straight of the second lap in the semi-final that I didn’t realise how fast I was going. It’s weird. It’s kind of the easiest race I’ve ever run. At 25, Oskan-Clarke has time on her side – and, crucially, more time to concentrate on her training. Until last year she was still working in a sports shop in Windsor, fitting in early-morning sessions before rushing to work. Now she works as a personal trainer. “When I look back on what I was doing, I think, ‘Oh, my goodness’,” Oskan-Clarke reflects. “I would go to the track at 7am, do my run, do my weights, go home, quickly shower and eat breakfast and then ride my bike to work, which was half an hour away. I’d work from 11am to 5.30pm, ride home, then maybe do a bit of core work and have dinner. Despite her Beijing breakthrough, ‘Shelayna, the Personal Trainer’ continues to have a low profile. Not that she seems remotely bothered by a lack of media recognition. Still, there is more to Oskan-Clarke than she might herself think. She is a former county hockey player, for one thing. She also has a sports science degree from Brunel University. She says she has not had track and field stars as idols over the years but adds: “I recently read the biographies of Jessica Ennis-Hill and Kelly Holmes. They were patient, weren’t they? And gutsy. They’re quite inspiring. “I don’t normally read biographies but I’ve bought a few recently. I’ve read Serena Williams’ book, and her dad’s. Which is what Ayo Falola’s latest world class 800m performer did in Beijing to become the 21st member of the Great Britain Sub-Two Club.